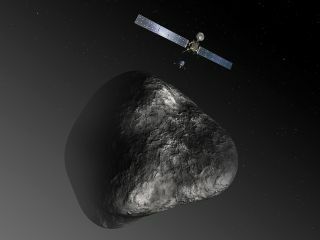 A European spacecraft will emerge from 2.5-year hibernation Monday (Jan. 20) to begin preparing for a long-awaited encounter with a comet in May. The European Space Agency's Rosetta probe is scheduled to wake up at 5 a.m. EST (1000 GMT) Monday after sleeping in deep space for the past 957 days. The first signal from a newly alert Rosetta is expected to arrive here on Earth no earlier than 12:30 p.m. EST (1730 GMT) Monday, ESA officials said. To date, the probe has completed four speed-boosting planetary flybys — three of Earth and one of Mars — on its circuitous journey to the comet, which measures about 2.4 miles (4 kilometers) across. Rosetta also zoomed past and imaged two asteroids (2867 Steins in September 2008 and 21 Lutetia in July 2010) before entering hibernation mode in June 2011. Monday's wakeup initiates the final leg of Rosetta's long trek. The probe will meet up with 67P/Churyumov-Gerasimenko in May, just inside the orbit of Jupiter, and study the comet as it gets closer and closer to the sun. But that's not all. In November 2014, the Rosetta mission will drop a 220-lb (100 kilograms) lander called Philae onto the surface of 67P/Churyumov-Gerasimenko to get an up-close look at the composition and structure of the comet's nucleus. Philae will drill more than 8 inches (20 centimeters) into the comet, collecting samples for analysis by the lander's onboard laboratory. The groundbreaking Rosetta mission should reveal new insights about comets and the solar system's early days, ESA officials say. "Comets are considered the primitive building blocks of the solar system, and likely helped 'seed' the Earth with water, and maybe even life. By studying the nature of the comet’s dust and gas, Rosetta will help scientists learn more about the role of comets in the evolution of the solar system," ESA officials write in a Rosetta mission description. "Rosetta will be the first mission ever to orbit a comet’s nucleus and land a probe on its surface," they add. "It will also be the first spacecraft to fly alongside a comet as it heads towards the inner solar system, watching how a frozen comet is transformed by the warmth of the sun." The main Rosetta spacecraft and the Philae lander will continue studying the comet until December 2015, when the mission is slated to end.